Excellent win for injury-hit Arsenal. A thoroughly professional performance. One win in seven Premier League games for Swansea now. Thanks for your company. You can catch all the reaction from this game and the rest of today's Premier League fixtures on the BBC Sport website. Manchester City have regained the lead against Norwich so Arsenal will not be going top at the moment. That won't worry Arsene Wenger. This has been a professional performance from his injury-hit side. Marlo: Arsenal seem to have the ability to just blow away any team in 10 minute spells. Also Flappyhandski showing why Arsenal let him go. Edmund: Classic away performance from the Gunners. Championship winning form? Faddi: Let's take a minute to appreciate Mesut Özil. Double figures in assists already! Big news from the Etihad Stadium. Norwich City have equalised against Norwich City. Arsenal will be two points clear at the top of the Premier League table if it stays like that. Ashley Williams lets fly from the edge of the Arsenal area and forces Petr Cech into a decent save. Swansea look shell-shocked. They had their chances in the first half but they are now paying the price for not punishing their opponents. Joel Campbell surely seals the points for the Gunners after thrashing home from seven-yards out following Mesut Ozil's low cross. Is that game over as Arsenal double their lead in controversial circumstances? Mesut Ozil swings the ball in, Ashley Williams only succeeds in flicking it on while attempting a clearance and Laurent Koscielny is there to turn over the line after Lukasz Fabianski drops the ball after appearing to be fouled by the goalscorer. Laurent Koscielny misses a fine chance to double Arsenal's lead when he heads over at the back post. The post is still trembling after Hector Bellerin clattered into it as he slid in to block a shot from Andre Ayew. The Swansea forward was flagged offside, but that didn't stop Bellerin from hurtling heroically into the woodwork. Fortunately, he didn't 'do a Phil Babb' but the heavy contact with his midriff looked painful nonetheless. Mathew: To win a title you need a combination of skill, passion and luck. Arsenal seem to have that this season. Long way to go though! Ramesh: Replaced by Walcott was the kick up the backside Giroud needed to turn into a goal scoring machine. Paul: For all abuse we (Arsenal) get about defence etc, we are the joint best defence in league and clearly City's biggest challenger. Another Swansea attack. Andre Ayew looks like he is about equalise in front of a gaping net but he's offside as he latches onto Gylfi Sigurdsson's pass. Hector Bellerin, who does not know his opponent is offside, nevertheless makes a heroic clearance to deny Ayew. Swansea have responded well to falling behind. Gylfi Sigurdsson lets fly from distance and forces Petr Cech into a decent stop. Not only has Olivier Giroud's goal given Arsenal the lead it has also put them top of the 'as it stands' table as Manchester City are still being held at home to Norwich City. It is also Arsenal's 2,000th goal in all competitions since Arsene Wenger took charge in 1996. First blood to Arsenal and it's that man Olivier Giroud with a free header from his side's second corner of the game. That's Giroud's fourth goal in five games for his club. "Gomis has had a good header, but he's not just about goals - he's got good awareness. I think Swansea will have been buoyed by their win last week and Arsenal are missing the likes of Walcott and Oxlade-Chamberlain." Encouraging start to the new half by Arsenal - they've just won their first corner of the match. A quick glance at the 'as it stands' table shows Arsenal remain second level on points with leaders Manchester City. Like the Gunners, City are also being held 0-0 by Norwich. Swansea remain in 12th position. The good news for Arsenal is that Olivier Giroud is able to carry on. The bad news? His team isn't firing. Swansea have had the better chances but will they rue those missed chances? Look away now Arsenal fans. Olivier Giroud is down receiving treatment. It doesn't look good. That Gunners injury list could be about to have a new name added to it. Liban: Bellerin can't dive into challenges on Montero or else he will cut inside and cause danger. Show him down the line. Stephen: Sorry but Joel Campbell is a lazy player, never in a million years should he playing for Arsenal. We're really missing Ramsey. Andy: Here's the plan, Monk is under pressure, Swans are struggling, could get three points and go top of the league. Plays Joel Campbell. Lovely passage of play from Swansea almost unlocks the Gunners defence. Swans boss Garry Monk will be slightly disappointed his side is not leading with half-time fast approaching. Television replays suggesting Per Mertesacker was lucky to escape conceding a penalty after the ball struck his arm from an earlier Swansea free-kick. Joel Campbell with a snap shot which lacks intent straight at Lukasz Fabianski. After a shocking first 20 minutes, this game has come alive. Jonjo Shelvey heads over the Arsenal bar after the Gunners defence had failed to deal with a free-kick. Swansea are enjoying a decent spell of pressure but you feel they have to score - otherwise these misses could prove costly. That's more like from Arsenal. Olivier Giroud, who has been in excellent goalscoring form, fires narrowly over from just outside the area after Alexis Sanchez's clever pass. Bafetimbi Gomis scored the winner on both occasions as Swansea did the double over Arsenal last season - but he is currently in the midst of a barren spell. The French international striker has failed to score in his last six Premier League appearances, and his dithering miss after trying to round Petr Cech is perhaps symptomatic of his loss of confidence. Another chance for Swansea but Bafetimbi Gomis heads straight at Petr Cech.The hosts are beginning to exert their authority. Will Swansea pay for not putting that away? It's the clearest chance of the match so far. We've seen little attacking threat from Arsenal so far. Huge drama. Jonjo Shelvey feeds Bafetimbi Gomis with a defence-splitting pass which sends the Swansea striker clean through with just the keeper to beat. He's on-side as he rounds Petr Cech but crashes to the ground and the chance is gone. Is Gomis brought down by Cech? Not according to Kevin Friend. Kyle Naughton receives a lecture from referee Kevin Friend after one niggly foul too many. First bit of quality so far - and so nearly a goal for Arsenal. Joel Campbell goes oh so close to finding the net in his first Arsenal league start after a delicious curling first-time attempt from just outside the area. Very cat and mouse. Sloppy passing by two teams who are struggling to click into gear. We're still awaiting the first save - as well as the first corner. Petr Cech plucks an aimless ball out of the air. This is short on entertainment, short on quality. Put it like this. The way this is shaping it will be last on Match of the Day. Got the picture? First sign of a threat from the Swans. Jefferson Montero gets behind the defence and crosses into the Arsenal box but Laurent Koscielny heads clear. Arsenal counter, Nacho Monreal flashing a chance well wide after the home defence had failed to clear the ball. The Gunners are beginning to settle. A clear handball by Jefferson Montero goes unpunished deep inside the Swansea half. Slow start by both teams, to be honest, with neither keeper having anything to do. Cautious start by both teams. Lots of passing - little attacking intent from either side in the opening two minutes. Can Arsenal make it five league wins on the spin? 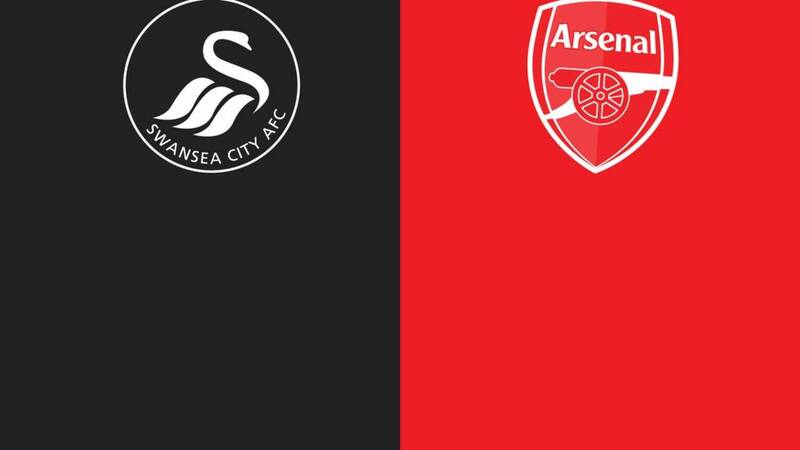 Will Swansea make it three victories out of three against the Gunners? The visitors in their change strip get us under way. Quote Message: How can I question Arsene Wenger for what he's done at Arsenal? It might be rushing players back too soon, it might not. I wouldn't want to questions his training methods." How can I question Arsene Wenger for what he's done at Arsenal? It might be rushing players back too soon, it might not. I wouldn't want to questions his training methods." "It's all about being better than everybody else. There's been so much inconsistency in the Premier League this season, so Arsenal are surely in with a chance. I want them to be stronger mentally and a little bit tougher in their performance." Just when you thought Arsenal were primed for an assault on the top of the table, along comes an injury crisis. Defeat at Sheffield Wednesday was perhaps less damaging than the injuries to Alex Oxlade-Chamberlain and Theo Walcott. which have left them without seven midfielders or forwards with games against Bayern Munich and Tottenham coming up. Swansea did the double over Arsenal last season but have been struggling for form. It's hard to claim the win over Aston Villa represented an upturn - the ability to beat Villa is a minimum requirement at the moment. But Swansea are dangerous and will be keen to show once again that they're not just 'Arsenal-lite'. Unsurprisingly Swansea City boss Garry Monk names the same side that started the 2-1 win at Aston Villa last Saturday. Swansea City XI: Fabianski, Naughton, Fernandez, Williams, Taylor, Ki Sung-yueng, Shelvey, Ayew, Sigurdsson, Montero, Gomis. Arsenal, who are missing a string of players due to injury, make two changes to the side that started their last Premier League match - a 2-1 win over Everton last weekend. Forward Joel Campbell makes his first Premier League start for the Gunners while defender Per Mertesacker also returns. Alex Oxlade-Chamberlain is injured while Gabriel is dropped to the bench. Arsenal XI: Cech, Bellerin, Mertesacker, Koscielny, Monreal, Coquelin, Cazorla, Ozil, Campbell, Sanchez, Giroud. More often than not it's the opposition who are over-worked when they come up against Arsenal, who start the day level on points with Premier League leaders Manchester City. Now it's the Gunners medical staff who have their work cut out. There's no Aaron Ramsey,Jack Wilshere, Danny Welbeck, Mikel Arteta, Tomas Rosicky, David Ospina, Theo Walcott or Alex Oxlade-Chamberlain for the game in south Wales. Mid-table Swansea, undefeated in the last three league meetings with Arsenal, can smell blood. Out of the League Cup, clinging on in the Champions League and their Premier League title ambitions under threat by an injury crisis. If that is not bad enough, Arsenal now face Swansea City - the team that did the league double over them last season. No wonder Arsene Wenger is looking a little concerned.